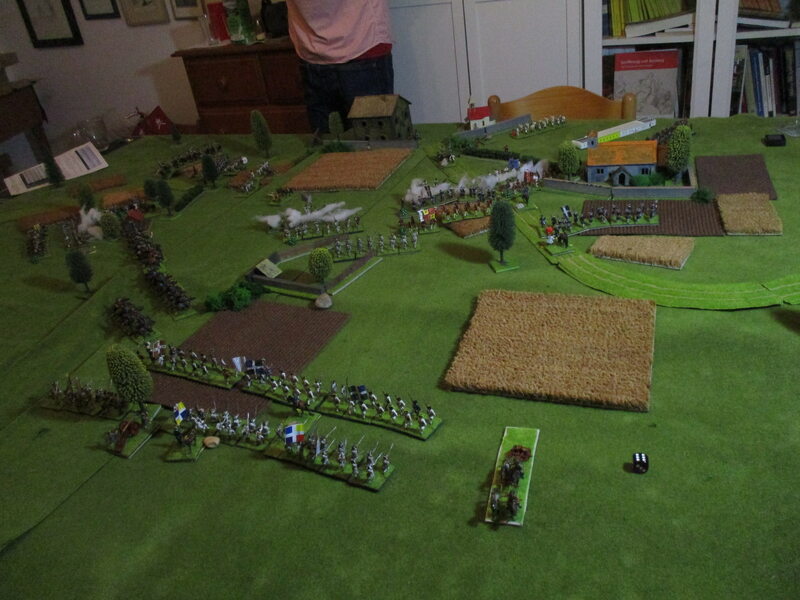 Yesterday night we played a refight of the battle of Bitonto. 1 bn. inf. "Carl Lothringen"
I had the role of the prince of Belmonte. I had some sort of a battleplan according to the victory conditions. I recognized the danger of my militia in front of San Antonio. Obristwachtmeister Ariosti was determinined to defend the abbey with his batallions of recruits. 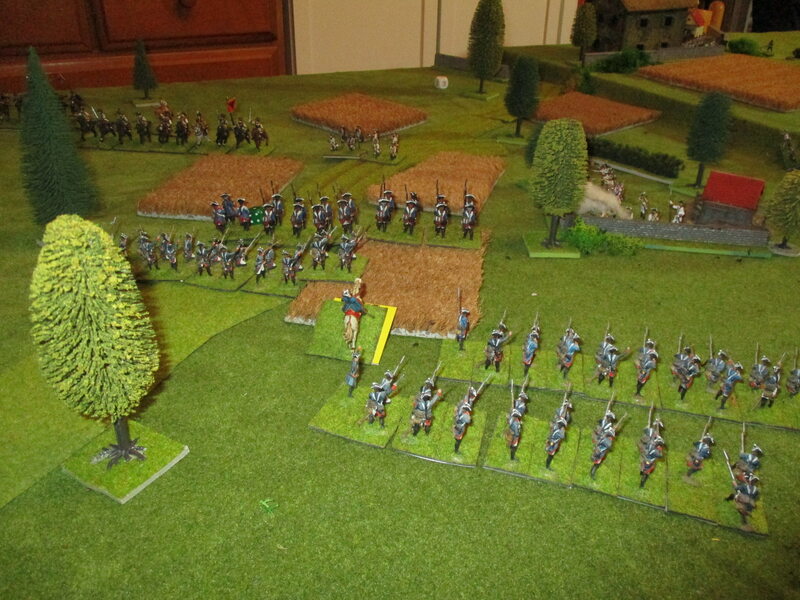 The Monteleone-grenadiers had to hold the cascine in front of Rutowski's brigade. 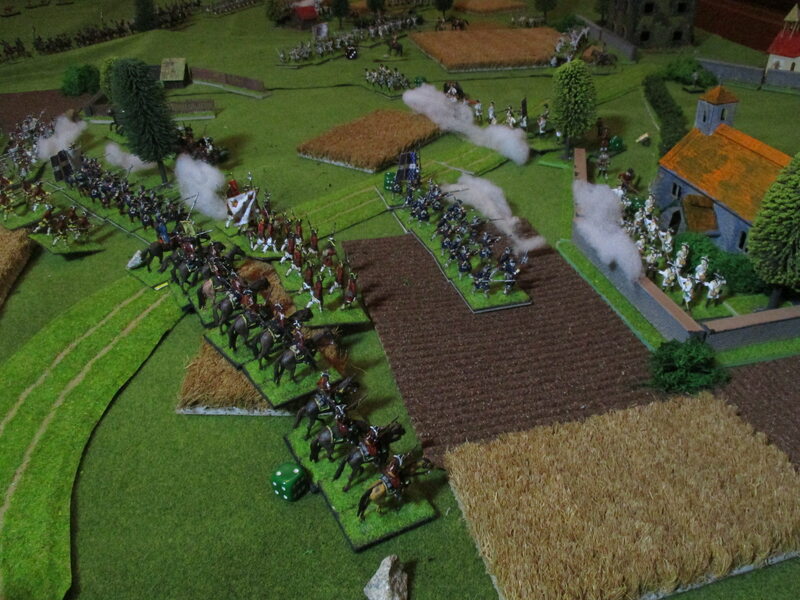 The Spanish artillery opened the fire at the cascine. GFWM Vinal decided the withdrawal of his grenadiers. Vinal noticed that the local militia would just be destroyed by the carabinieres reales and ordered a withdrawal of these poor men. Nevertheless I had the impression that the Spanish guards would overrun Vinal's and Ariosti's wing. 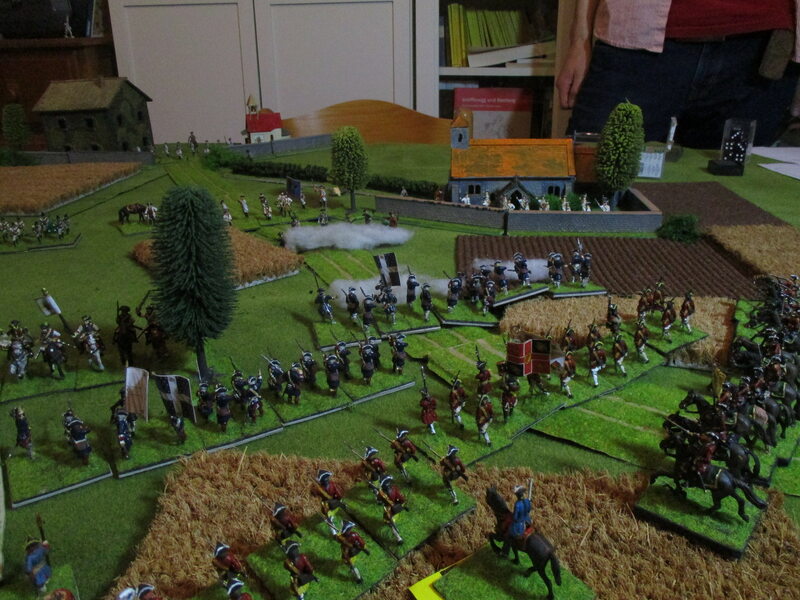 Vinal advanced with his superior batallion of Traun-infantry to cover the retreat of the militia. Mazeda advanced at GFWM Strongoli's small brigade. Strongoli got the orders defend in a more agressive style. He withdraw his detachment of fusiliers and occupied a cascine in front of his brigade with Daun-infantry. 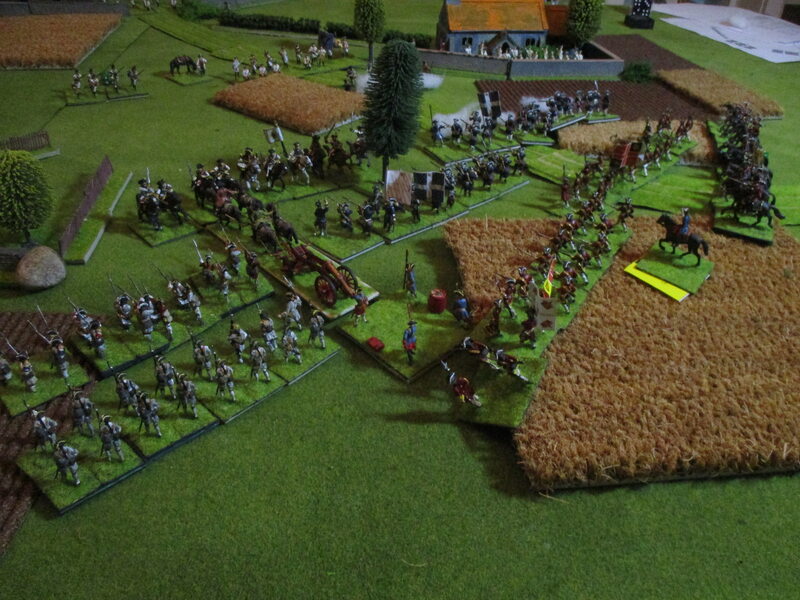 His cavalry moved around his infantry. Strongoli could throw his cavalry at the Walloon-guards who turned to face the charge. At the other wing Vinal showed his agressive side. Ariosti ordered his militia to advance, just to blocade the way of the Spanish guards. 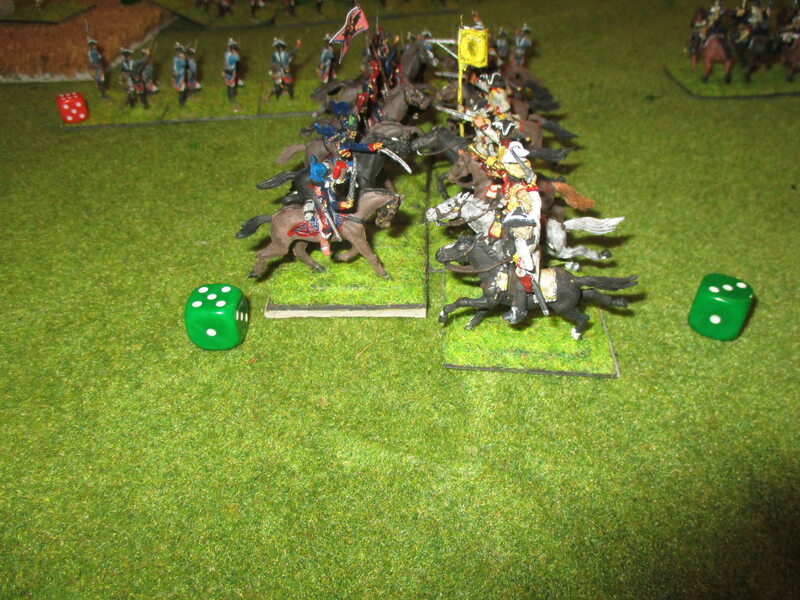 Vinal could throw his cuirassiers on the limbered Spanish artillery. A dangerous and bold move. At the same moment Mazeda started his attacks on the cascine at my right wing. The Walloon-Guards charged with two batallions. One of them had to retreat. The reforming left batallion was attacked by Csáka-hussars under the personal command of Strongoli, who destroyed the Walloon-infantry. 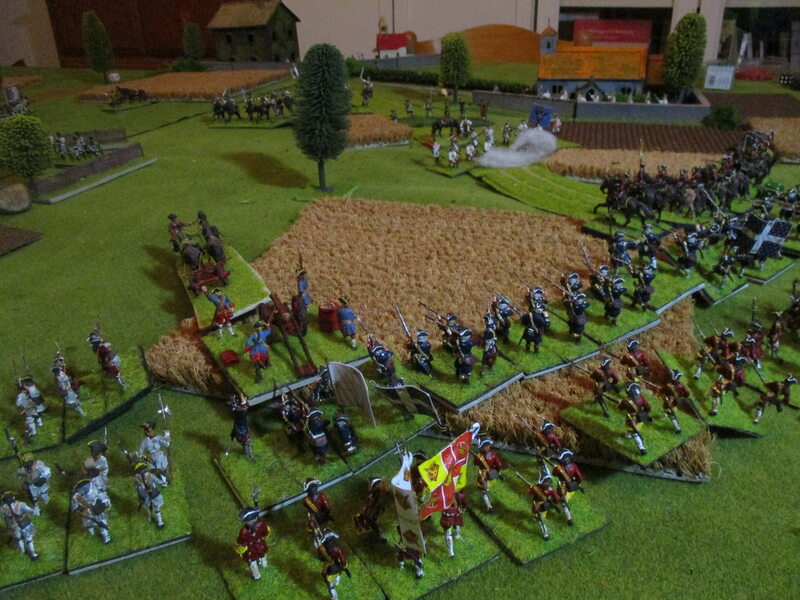 One hour of fighting and the Spanish lost 2 units already - a fine beginning. The fortune of war changed. 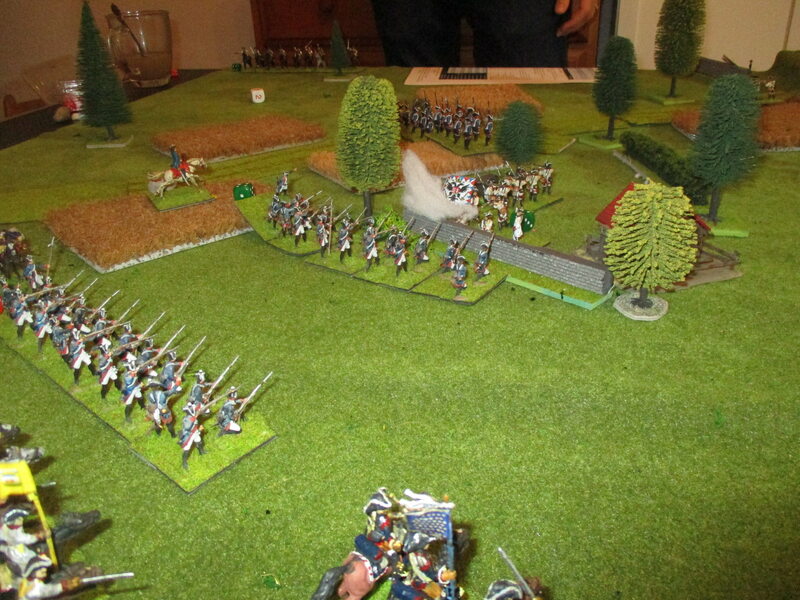 The Korkozowa-cuirassiers were shot down by Spanish grenadiers and guards while the first unit of Pozzobianco's brigade advanced far enough to shoot at Ariosti's recruits. 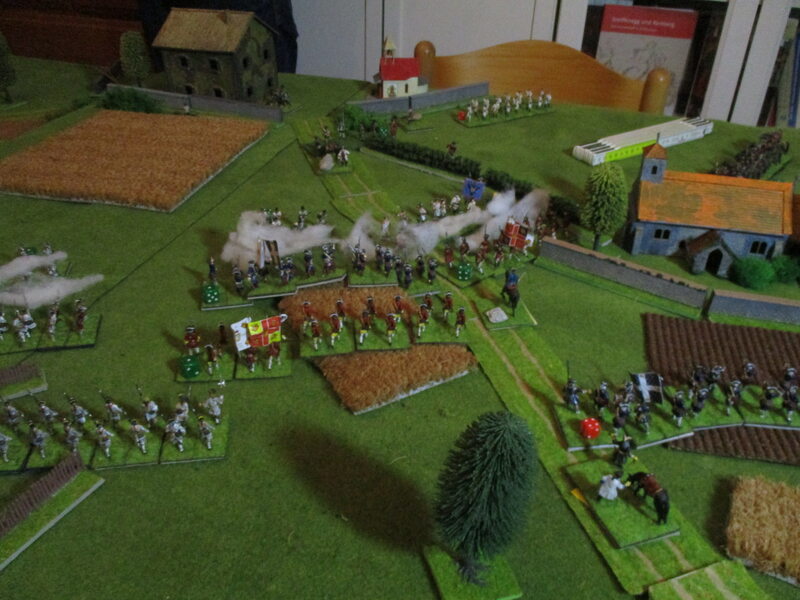 At Strongoli's wing the second attack was more successfull and the defenders of the cascine were routed. However the attackers retreated too. The victorious Csáka hussars were eager to pursue the routed Walloon-guards although Generalwachtmeister Strongoli forbit it. They run in the swords of Eboli's left unit of horse. What a desaster! Now Vinal was sure that Ariosti's recruits could not hold S. Antonio and had to withdraw. Naturaly the guards captured the abbey, a mighty stronghold. 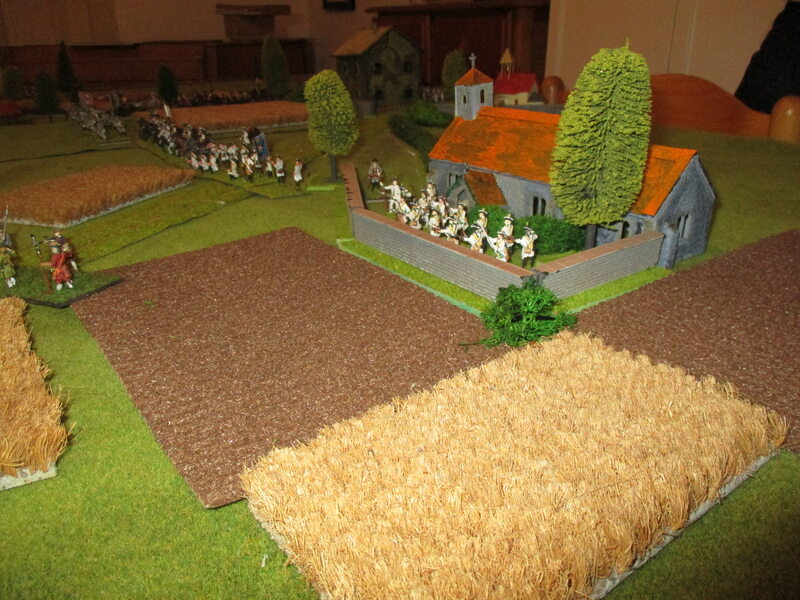 But the Spanish guards were driven off the abbey and retreated after 2 hours of fighting (turn 6!). The final moments saw plenty of fighting. Rutowski had just marched forwards and backwards. Eboli and the Spanish center had not moved enough to enter the fighting but gave me a lot to think about. 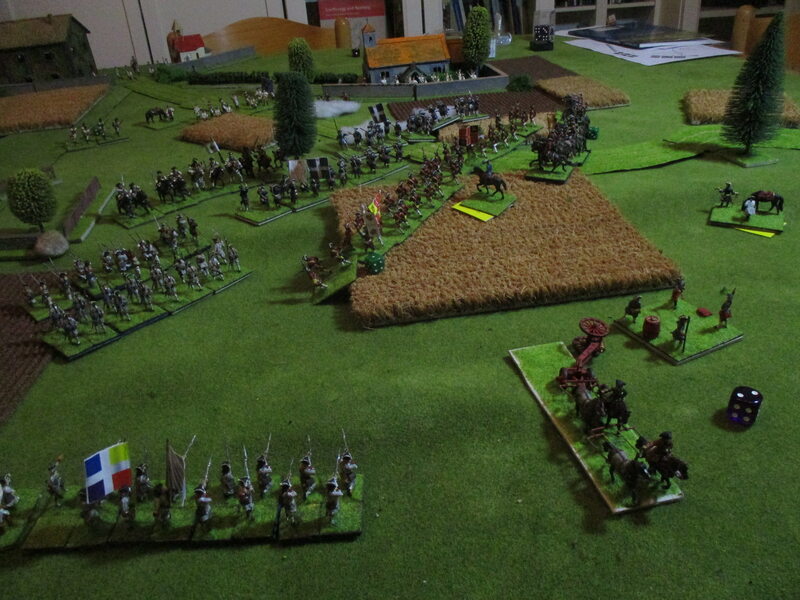 Especially Eboli could easily charge in the flank of my central infantry units. 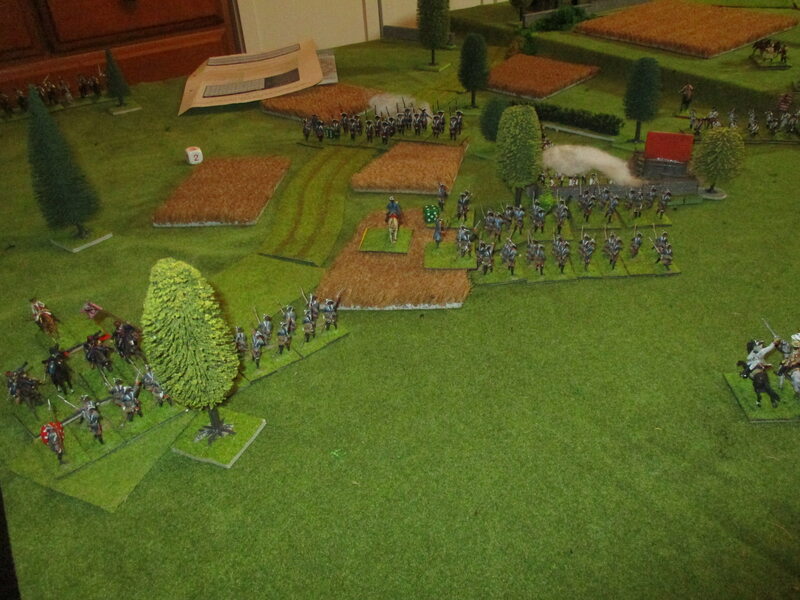 The Walloon-guards advanced at the cascine garrissoned by one of Rutowski's batallions. The last chance for the Spanish to win was to destroy my army. GL Montemar ordered a final advance of all his troops. It was too late when the carabinieres reales moved around the abbey with a double move. Vinal decided to stay and fight. 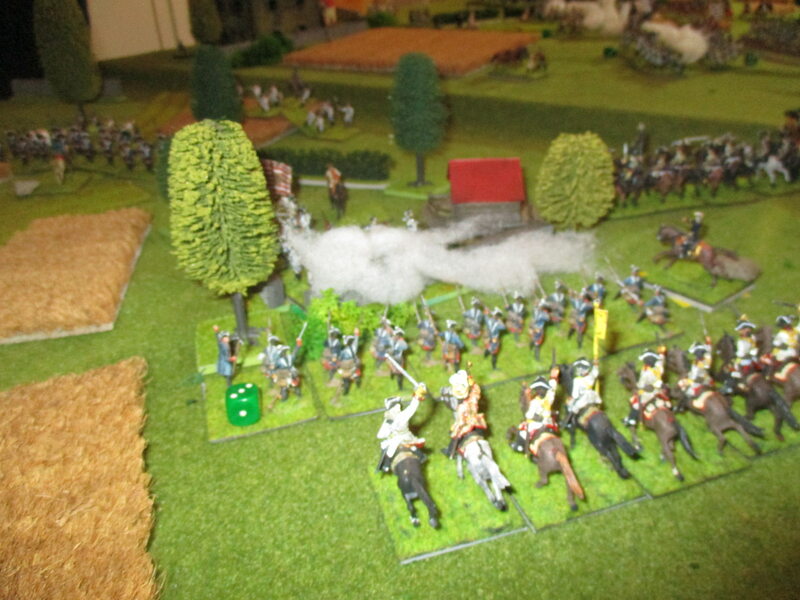 His volleys were fruitless, but the Spanish guards performed surprisingly well in a firefight. 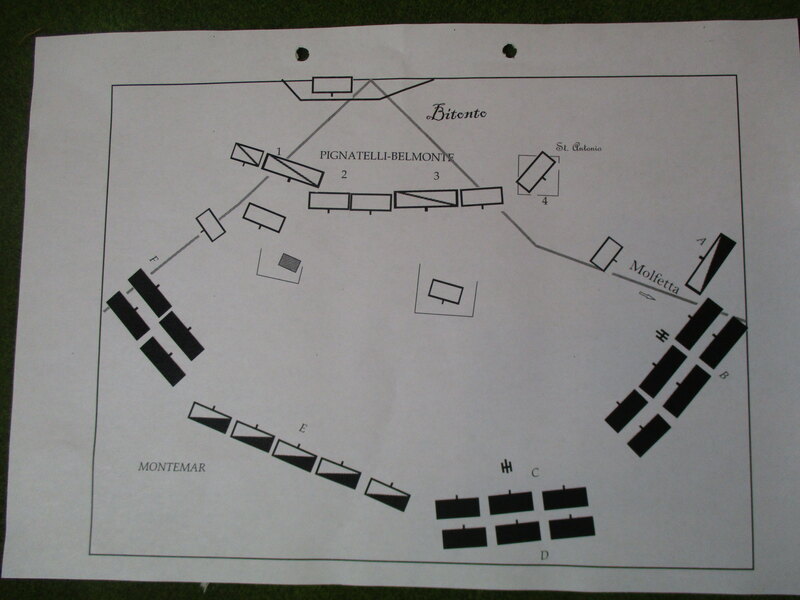 The last unit of Mazeda's brigade which could seize Bitonto was attacked by Strongli's detachment of fusiliers in front and by the Pegnatelli-cuirassiers in their back. I even send Obrist Mulrian's recruits. A final view on the battlefield. Pignatelli-Belmonte's army retreated in good order, although one of his brigades (Strongoli's) was broken. 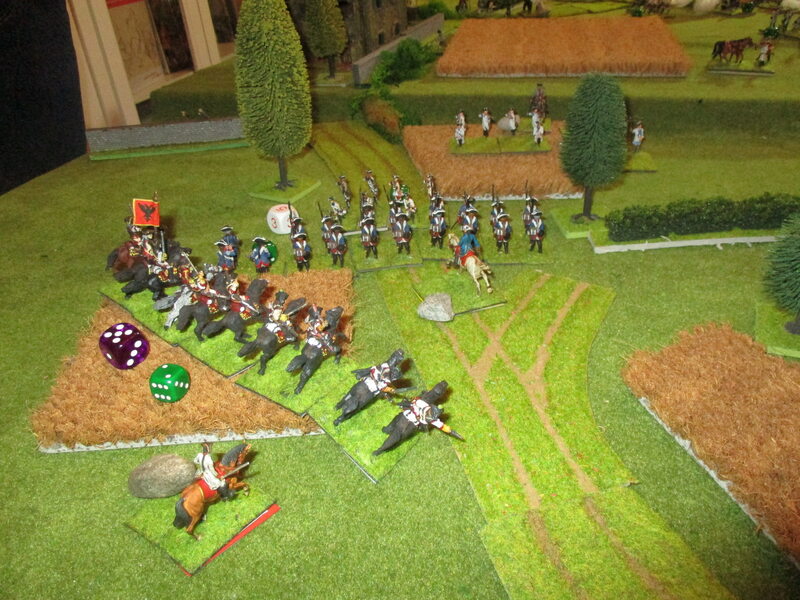 But it was crucial for the outcome of the campaign that the Spanish lost no cavalry and the Austrians most of their cavalry. A great battle. We played around 3 hours. I liked very much this battle, it was really a big one! For sure it was much different from the one I presented, you changed the settings and the table layout and now the game was balanced! 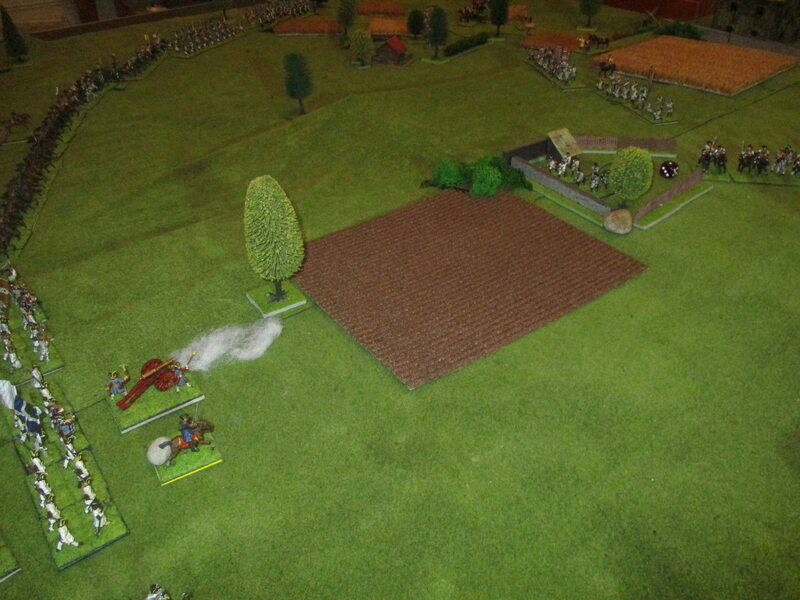 Now the Austrian positions are nearer Bitonto, so they must stand and fight where they are! 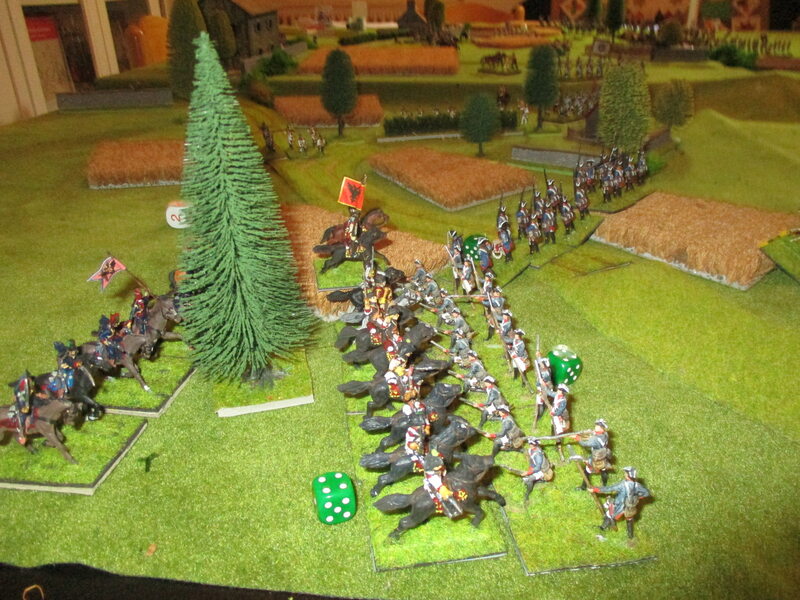 A small correction: The Austrian cuirassiers were a large unit, so the Austrians must have lost 4 Points. The cuirassiers were large, but the hussars were small. Nevertheless I think that it would be fair if the Austrians would destroy for example the Walloon-guards and the Independent unit of carabinieres reales that they would win a Minor victory. To destroy two of the strong brigades is very unlikely. To hold S.Antonio would be maybe possible. Perhaps I missed the chance to replace the recruits. I hope to play Guastalla in November, but need a second bn. 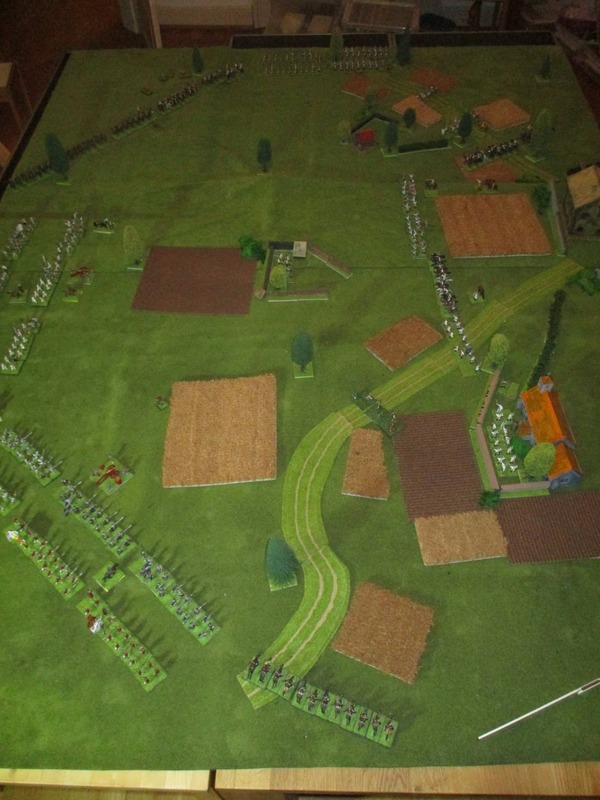 of Piedmont-infantry and more roads. Sorry, I forgot the Hussars were small. Eager to see your Piedmont army getting bigger! 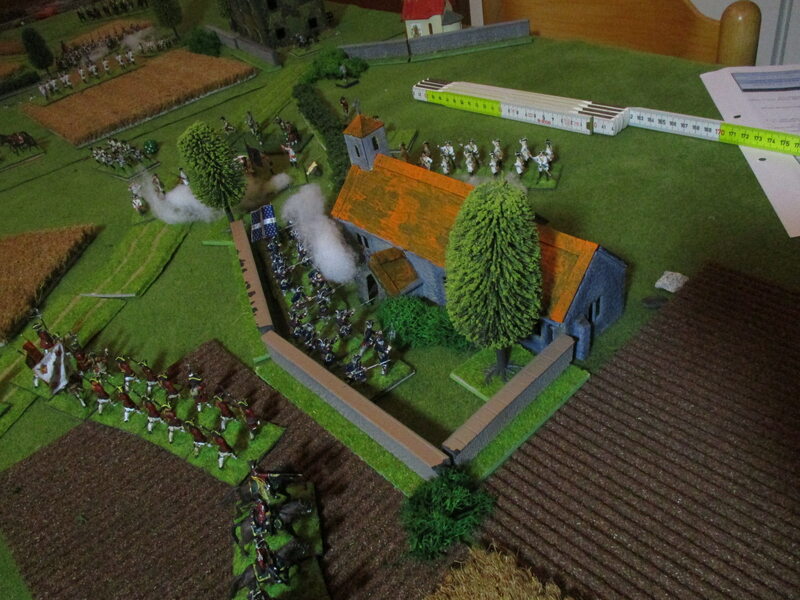 It would be a chance for the Spanish to leave Montemar in the center and place both generals of the infantry brigades near him. My wife decided to put him at the right wing. But she nevertheless never got a double move. Excellent battle report, my friend! Good looking table and troops. Very enjoyable read. 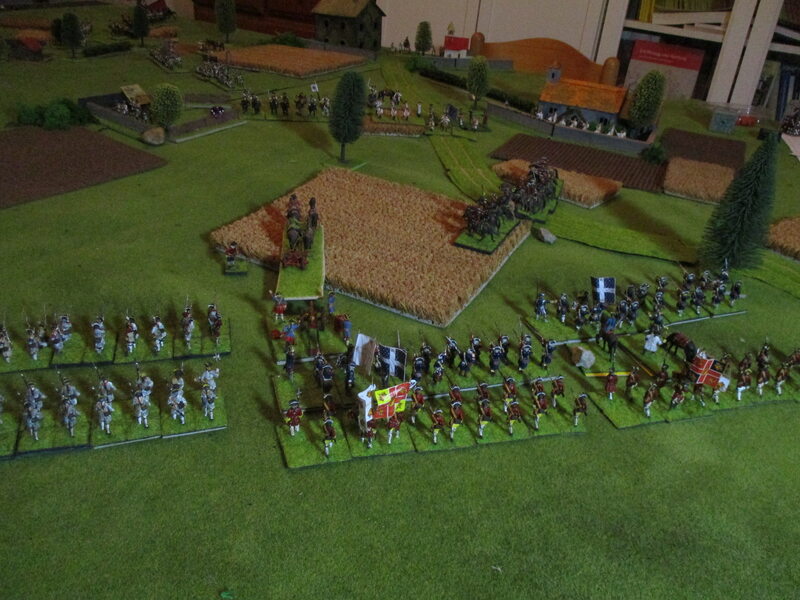 An excellent battle report and wonderful photo's, thanks for posting.